cDepartments of Neurosurgery (M.Y., K.T., K.Y., H.O. )dNeuroendovascular Therapy (H.O. ), Juntendo University School of Medicine, Tokyo, Japan. Examples of MRA scoring. The MRA scores by 2 observers were classified on a 4-point scale as follows: 1, (A); 2, (B); 3, (C); 4, (D). Outlined arrows are the stented segment. A 73-year-old woman. 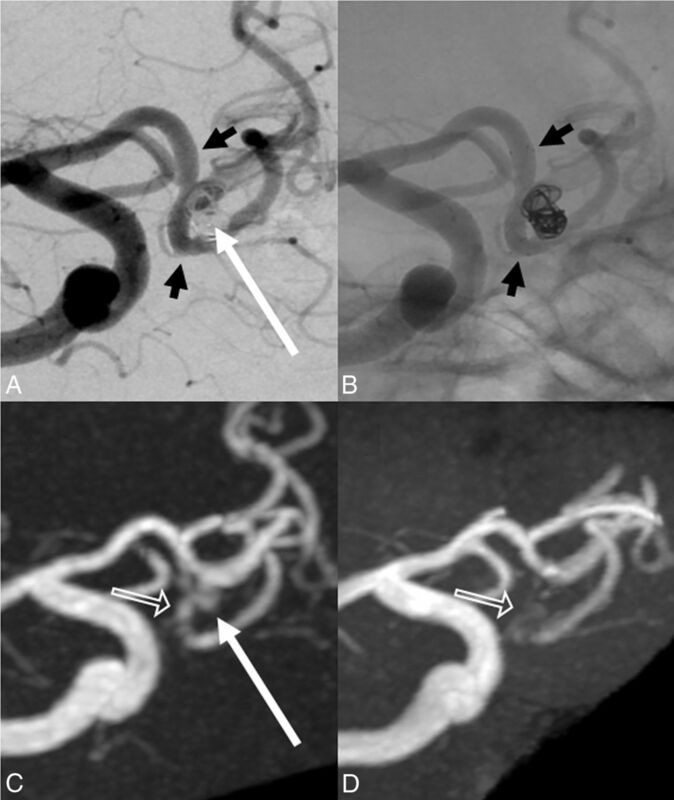 A, Stent-assisted coil embolization of the anterior communicating artery was performed with a LVIS Jr. stent (2.5 × 17 mm). The aneurysm remnant is indicated by the long white arrow. Short black arrows indicate stent edges. B, X-ray digital angiography reveals stent edges (short black arrows). C, Silent MRA shows minimal signal loss at the stented segment (outlined arrows). The aneurysm remnant is visible (long white arrow). D, 3D time-of-flight MRA shows complete signal losses at the stented segments (outlined arrows). The aneurysm remnant is not depicted. The scores of Silent MRA by 2 observers are 4 and 4. The scores of 3D TOF-MRA are 1 and 1. A 71-year-old man. A, Stent-assisted coil embolization of the anterior communicating artery is performed with a LVIS Jr. stent (2.5 × 17 mm). The neck remnant is indicated by the long white arrow. Short black arrows indicate stent edges. B, X-ray digital angiography shows the stent edges (short black arrows). C, Silent MRA shows minimal signal loss at the stented segment (outlined arrow). The neck remnant is depicted almost equally well as with digital subtraction angiography (long white arrow). D, 3D time-of-flight MRA shows almost complete signal loss in the stented segment (outlined arrow). The neck remnant is not depicted. The scores of Silent MRA by 2 observers are 4 and 4. The scores of 3D TOF-MRA are 1 and 1. A 45-year-old woman. 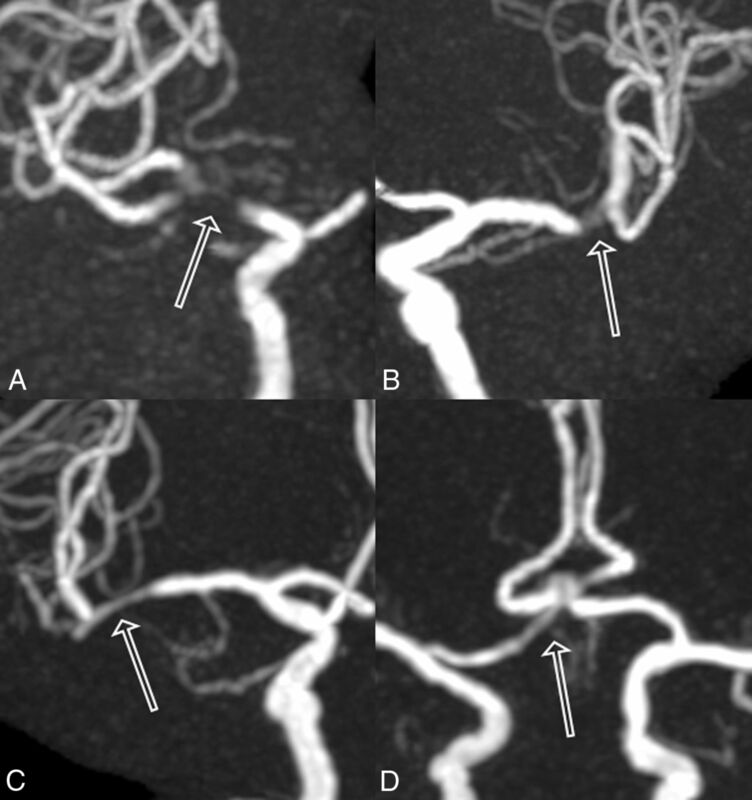 A, Stent-assisted coil embolization is performed with LVIS Jr. stents (2.5 × 13 mm and 2.5 × 17 mm) for a left middle cerebral artery bifurcation. The neck or aneurysm remnant is not depicted. Short black arrows indicate stent edges. B, X-ray digital angiography indicates stent edges (short black arrows). 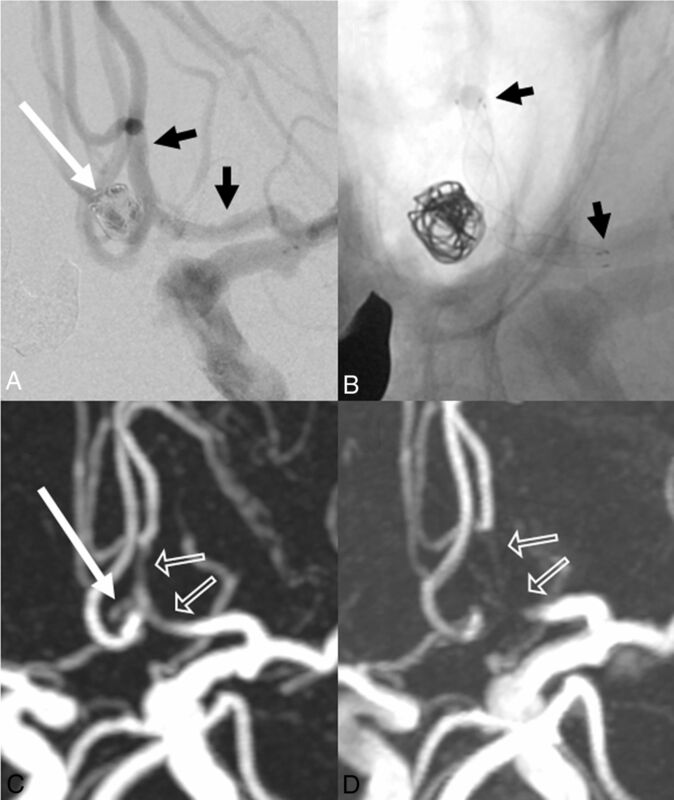 C, Silent MRA depicts the aneurysm remnant (long white arrow). Stented segments are slightly visible, and moderate signal loss is apparent on Silent MRA (outlined arrows). 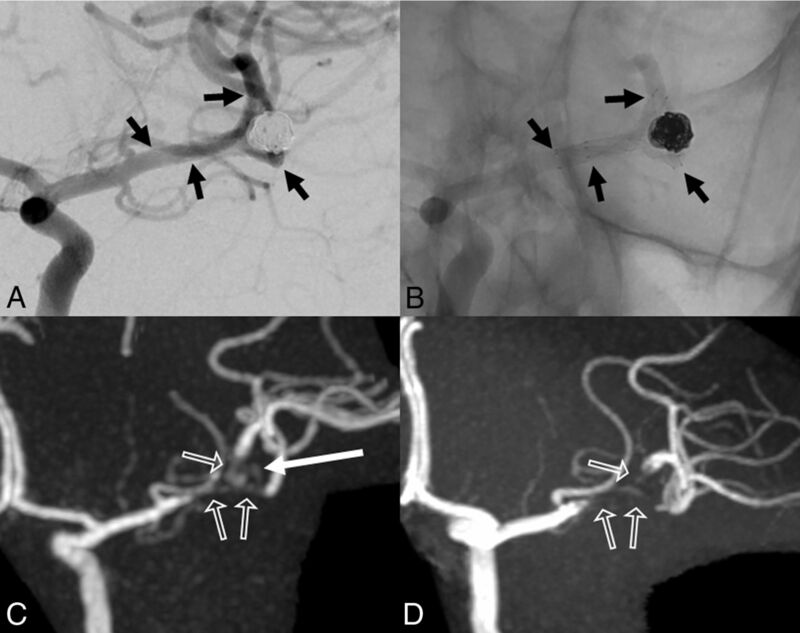 D, 3D time-of-flight MRA does not depict the neck or aneurysm remnant and yields a complete signal loss at the stented segment (outlined arrows). The scores of Silent MRA by 2 observers are 3 and 2. The scores of 3D TOF-MRA are 1 and 1.